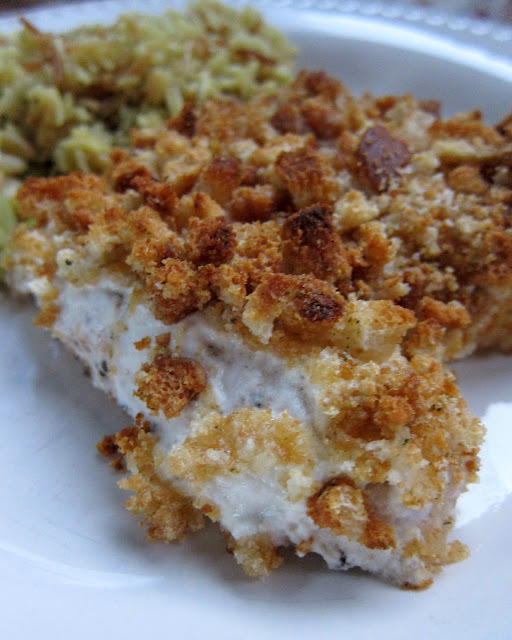 Sour Cream Chicken - chicken tenders topped with sour cream and crushed croutons - quick and delicious! Great weeknight meal! Ready in under 30 minutes! I found this recipe on Pinterest - my favorite source of inspiration. This chicken is best described as a deconstructed chicken casserole. I actually thought this was easier and better than a regular chicken casserole. I used full fat sour cream, but I think light sour cream would be fine. I would stay away from fat free sour cream - I think you need some fat to flavor the chicken. I think our favorite part of the dish was the crunchy crouton topping - YUM! Give this a try the next time you need a super quick weeknight meal. Sounds delicious! I saw this pass through Pinterest myself, and now I have to try it! You are finding such great recipes there! Love Pinterest! I make a version of this with mayonaise and cornflakes-bizarre but delicious. Sounds yummy.. I will try this as soon as I get a new oven... mine is broken. :( getting a little tired of microwave cooking. I made this but I added some shredded cheese under the crackers. It was SO GOOD!!! Good lord, girl, that looks like comfort food on steroids! I just popped this in the oven (1/3/12). I used a can of white meat chicken, sour cream, seasonings. I didn't have croutons, but had a box of stove top stuffing mix that I used instead. I'm serving it with roasted yellow squash and green salad. Yummy! Something I gotta try. Sounds delicious. I would love to use this recipe but I don't have the croutons, so I'll use rizt cracker crumbs. Thank you for a starter dish.